For the past few weeks we have been hearing about a new Speed Concept coming in the not-too-distant future. Most of the rumors said Kona, but we were thinking Interbike sounded more likely. It turns out that both the rumors, as well as our own intuition, were wrong because here it is–the 2014 Speed Concept. We hesitate to call it “all new” since it’s more of an evolutionary update to the previous SC, but evolution can take some pretty giant leaps and this may indeed be one of them. 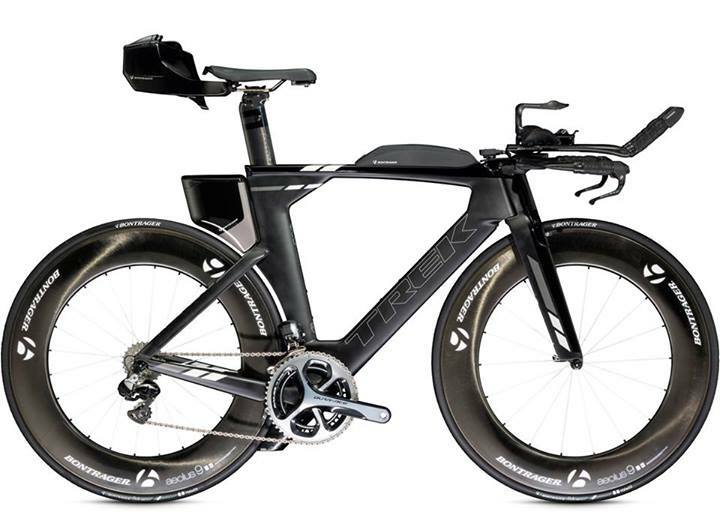 Trek is claiming that the 2014 SC represents a 99 second improvement over its old form in Ironman Hawaii and 148 seconds in Ironman Arizona when ridden at a 20mph average (yes, a manufacturer used a race average that the majority of their riders will actually see). To get these gains, Trek used a number of the techniques we have seen used by other manufacturers on the current generation of superbikes. The first thing you’ll notice when you see the SC is that the frame has started to more closely imitate the shape of the other superbikes now available. The frame has deepened, specifically at the top tube\seat tube junction, so much so that you are quickly reminded of the Slice RS. Additionally you will notice how the seat tube hugs the wheel just a bit more than it had with the first Speed Concept. For the fork, Trek has followed Cervelo’s lead and gone with a choice of two different options. First is a “standard” fork that is UCI compliant with a 3:1 aspect ratio. For the triathletes out there (and Trek recognizes that the majority of the SC buyers will fall in this camp), there is a UCI-illegal, high-aspect-ratio (6:1) fork specifically designed to achieve every last bit of aerodynamic gain possible. Finally, let it also be said that Trek has left no stone unturned in its quest to make the SC the fastest possible frame out there, going as far as to look under the bottom bracket to find some additional speed. 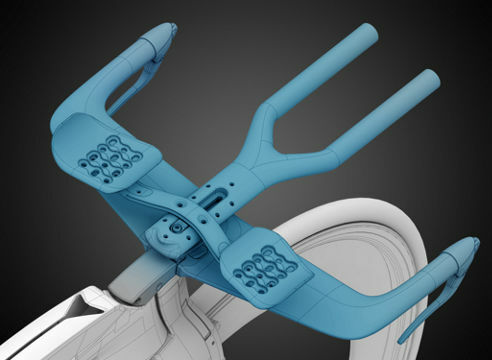 This quest has resulted in a feature that Trek has dubbed the “Speed Fin”–a triathlon specific rear brake cover that integrates a fairing to both improve aerodynamics as well as stiffen the brake (a UCI legal cover is available that does not include the fairing but still stiffens the cover). 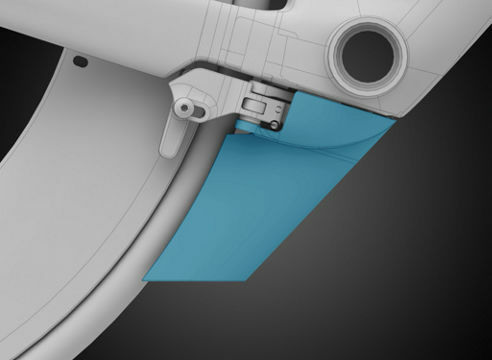 Trek claims that the Speed Fin saves an average of 10 grams of drag between 0 and 12.5 degrees of yaw. Trek understands that no matter how fast they made the new SC, if riders couldn’t comfortable ride it, the aerodynamic enhancements to the bike would be for naught. To that end they looked to create a cockpit that had the greatest range of possible positions yet exposed the least possible amount of surface to that wind. The result was a new mono extension design that both increased fit possibilities yet simplified the adjustment process. 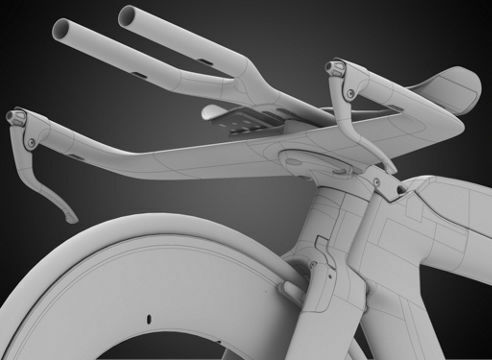 The key to this design strategy can be found in the aerobars. Rather than individual bars connected to the base bar, the new SC’s aerobars are one single piece and are available in S-bend, straight, ergo (skitip), and short ergo. The pads are then connected to the mono extension with two bolts. 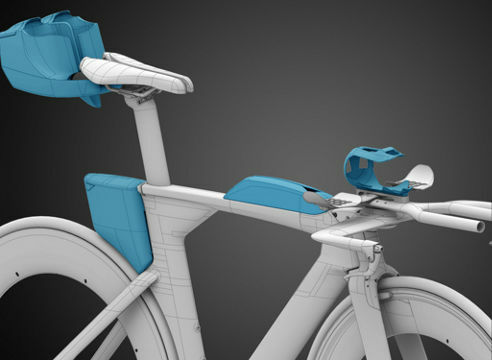 Trek recognizes how much of a pain it can be to adjust aerobars, but this bar seeks to change that. Loosening the above mentioned bolts allows you to slide the bar fore and aft as well as tilt up and down. When the original SC was released, one of its standout features was the Draft Box. This rear storage actually increased the aerodynamics of the SC. Trek has taken this concept to the next level with the new SC and claims that a rider who uses all of the storage options available would decrease their time in Hawaii by 151 seconds and in Arizona by an even 200 seconds. For those who love carrying “stuff” on their frame (Mike), the Speed Concept will meet all of your needs. Trek is releasing four separate add-ons with the new SC: a new Draft Box, 2-Pack Aero (rear hydration), Speed Box (bento box), and a torpedo bottle cage with an integrated computer mount. The new Draft Box is a bit larger than the original, yet is drag neutral—resulting in a product that you can use to carry your entire flat kit (C02, two tubes, and a multitool) without any fear of an aero penalty. The 2-Pack Aero holds two water bottles and has room for additional storage. Normally we would suspect that this would be drag neutral at best and at worst could slow you down. However, Trek’s engineers found that when the 2-pack is placed in a “neutral” position you will actually create less drag than you would experience without it. The new Speed Box is a bento box capable of holding two gel flasks or seven gel packs. Like the Draft Box, the Speed Box ends up being draft neutral. Finally, Trek—like Cervelo—feels that BTA is the way to go when it comes to hydration. They have released a new torpedo bottle cage with an integrated computer mount. The cage uses mounting holes on the mono extension, resulting in a clean and aero hydration setup. Pricing for the new Speed Concept falls in line with the current generation of superbikes. For $5,9999 you can get the SC 9.5 with Ultegra or for $11,549 you can go full DuraAce Di2. This is consistent with the Cannondale Slice RS Red for $11,000 and the P5-Six Di2 for $10,000. Trek does additionally offer the SC through their Project One customization program. We were able to get the price down to $5,732.99 by de-specing the bike and up to $16,516.47 by going a bit crazy (of course we need an SRM). Most important we were able to create a truly custom AeroGeeks version that we think would look fantastic in our garage.